Incidentally, traditional nutcrackers aren't very good at their job, well, you can crack the nut, but the point is to get at the nice bit inside, not create a situation where crazy- aunt-Jean's dog has a scary shard of shell embedded in his paw. No, get mole grips (UK)/curved jaw locking pliers (US) set the distance to "tasty bit diameter" and heave away, secure in the knowledge that the jaws will stop before destroying the interior. That, [bs], is one of the most brilliant ideas I have heard today. This idea does not actually crack the nut. Therefore it should not be referred to as a nutcracker. In the "Systematic Inventive Thought" method, the study of opening hazelnuts used to be part of the curriculum. It turns out that its done by pressurizing the container, and then releasing the pressure rapidly. The shells move outwards without damaging the nuts. [Max] I wouldn't say that it was BS, it actually sounded quite believable. 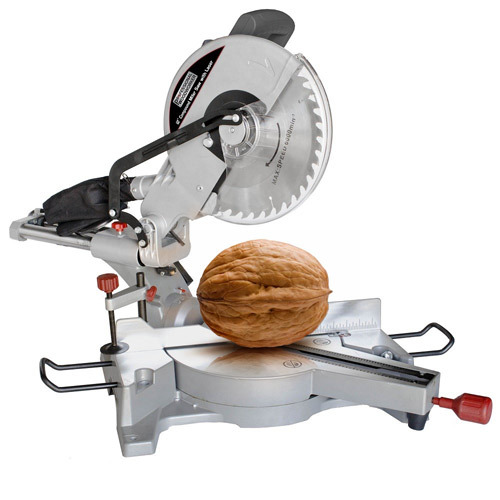 [pocm] The original invention was named the Miniature Mitre Saw Walnut De-shelling Kernel Extraction Apparatus, but our marketing department insisted we went for something "snappier".